Snoop Dogg to Elin Nordegren, "Take Tiger Woods Back"
The craziness that comes out of the headlines is sometimes too much to bare. However, it is certainly entertaining none the less. Apparently, Snoop Doggy Dogg is now a marriage counselor to the rich and famous. The Snoop Dogg also added that he can relate to his story because sometimes it takes a negative situation to turn into a positive. Snoop says he and his wife no longer look back at the past and have since moved forward. 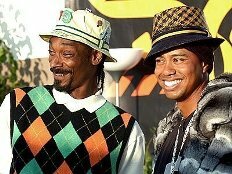 So Snoop Dogg has learned some things in life and is now giving some decent counsel to Tiger Woods and Elin Nordegren! And who would’ve thought that we’d see the day where Snoop Doggy Dogg was giving words of wisdom on life, marriage, peace, and happiness. I have to admit, I’m quite impressed with Snoop Dogg’s disposition and outlook on life!